Doc Rivers addresses the media before Thursday night's opener against the Oklahoma City Thunder. 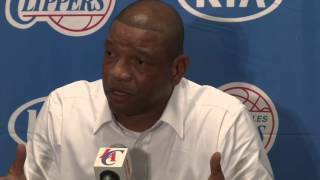 Pregame Press Conference: Doc Rivers - 1/7/15. Doc Rivers address the media before tonight's game vs. the Los Angeles Lakers. Jan 7, 2015 | 13:09. Now Playing.